Zebra photo ID systems offer stunning print quality and high reliability for secure, durable ID cards and badges. Choose between a wide range of single or dual sided bundles with direct-to-card or retransfer card printers. We have packaged everything that you need to issue all your badges easily and securely. 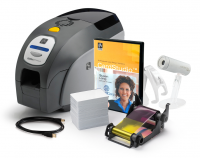 Each Zebra photo ID system includes a single or dual sided ID card printer, ID card software, web camera, color ribbon, and PVC cards. Overlaminates for laminating systems are also provided. All our Zebra photo ID systems come with our low price guarantee, toll-free customer support and free shipping right to your door.